Bladder cancer is one of the leading causes of death in the U.S., and while early diagnosis is critical to increasing survival rates, current diagnostic and monitoring methods including cystoscopy, biopsy, and tumor resection, are invasive and costly. 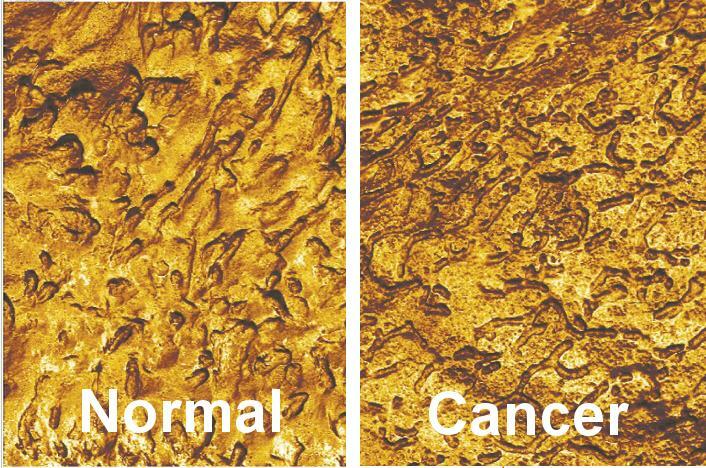 A Tufts University-led team of scientists has now developed a noninvasive approach that uses atomic force microscopy (AFM) and machine learning to identify cancerous cells in patients’ urine, by mapping cell surface features and topography at the nanometer scale. The researchers say their technology represents the first time that AFM has been used to help diagnose disease, and suggest that as well as being more accurate compared with cystoscopy, the method could feasibly be applied to detect other forms of cancer or noncancerous abnormalities in cells collected from body fluids, as well as monitor cells’ reactions to drugs. Bladder cancer is one of the world’s most common forms of cancer, with an estimated 81,190 cases and 17,240 deaths in the U.S. in 2018. The 5-year survival rate is as high as 95% when the disease is diagnosed early, but drops to 10% for patients with metastatic disease. The current gold-standard method for diagnosis includes cystoscopy (passing a camera into the bladder through the urethra), along with biopsy so that cells can be examined, and subsequent tumor resection. The recurrence rate for treated patients is 50–80%, so invasive, expensive cystoscopy exams still need to be carried out every 3–6 months to monitor patients. The Tufts University-led scientists have now developed a diagnostic approach that uses AFM and machine learning methods to image and analyze cells extracted from patients’ urine. AFM involves scanning over a surface with a cantilever, which is deflected as it passes over surface contours. Every deflection is recorded, to create a topographical map with a resolution of fractions of a nanometer. How the cantilever is deflected can also indicate physical properties of the sample, such as the adhesion force between the AFM probe and the sample surface. The scientists applied the technique to analyze urine samples from 43 control individuals without evidence of bladder cancer, and 25 patients with pathologically confirmed bladder cancer. The analyzed sets of surface parameters, including roughness, directionality, and fractal properties, derived from each image. Using machine learning enabled a more accurate recognition of these parameters. The results confirmed that cells extracted from the urine of bladder cancer patients demonstrated different features from those of control patient cells, which could be identified using the AFM and machine learning approach. Encouragingly, when used to examine just five cells’ per urine sample, the new technique demonstrated greater than 90% sensitivity, compared with 20–80% sensitivity for currently available noninvasive diagnostic approaches that use urine samples. Existing noninvasive tests include biochemical evaluation of the biomarker NMP22, genetic analysis using fluorescence in situ hybridization, or immunocytochemistry. The specificity of the AFM-based approach was also comparable to that of the other tests, at 82–98%.